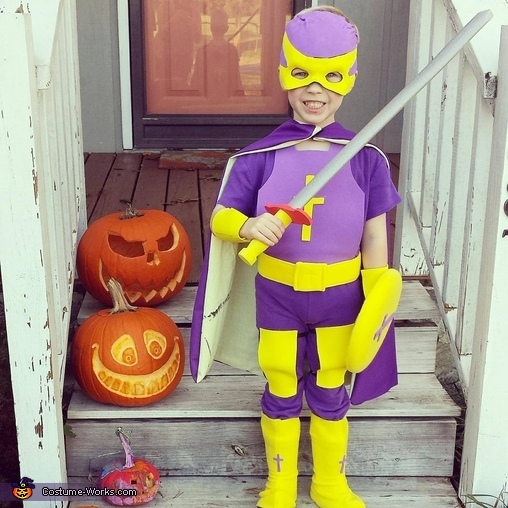 My son loves watching the new "Bibleman: The Animated Adventures" and wanted to be him for Halloween. Since it isn't a popular show, there aren't pre-made costumes for this character. So we made him Bibleman. I used craft foam to for the Breastplate, decorative crosses, wrist guards and upper leg armor (using elastic to slip over the arms and legs). I also re-purposing a Captain America mask by covering it with the foam to create the Bibleman helmet. I added elastic around the neck and the waist of the Breastplate in order to be worn. Like the blogger suggests, I would make the fabric longer to make sure it doesn't ride up. I did add elastic bands near the arch of the foot, but I would add another one towards the ball of the foot to keep the fabric covering the top of the shoes. And lastly for the cape, I purchased purple fabric, but not enough- I ended up using an old sheet I use to paint on for the inside fabric of the cape. I used a cape we already had as a template and attached Velcro to fasten around the neck after sewing it up. Hi, can you make one for my son? Is this something I can order from you for my son. There's a mother son dance in June and my son wants to be bibleman since it's a superhero theme. I'm in a high risk pregnancy right now so I'm not sure I would be able to get this done before baby comes and dance. Thanks for posting! really helped me make a bibleman costume for my son. I also made Bible girl for my daughter and me and my hubby were cypher and melody. Hey Ladies, Thank you for your interests, I am actually unable to make any of these. I hope that it may help with getting one created. Amazing!!! You have inspired me to make this for my son who has been asking constantly for a Bible Man costume. :) God Bless you! !